I don’t know if it’s because I’m exhausted by the end, but I always end up liking the last city I visit the least. It happened in Siam Reap (not that Angkor Wat wasn’t great, but I really liked Phnom Penh), it happened in Yogyakarta, and it happened in Vietnam. Ho Chi Minh is way more cosmopolitan than Hanoi and while that has its perks (hello, Mexican food! ), it’s also a lot more overwhelming. The traffic was insane (I witnessed several motorbike accidents) and it didn’t have any of the charm or uniqueness of Hanoi (more rats and cockroaches though). Still, we got to see some really neat things in the city, while enjoying delicious, fresh fruit smoothies. One of the first things we did (other than go on a wild goose chase in search of Chinatown) was set out for the War Remnants Museum. The museum was… hard to describe. It’s powerful, yes, and fascinating, but those words seem a little too trite. It was hard, but important, to read about the Vietnam War from the Vietnamese perspective. To be honest, I don’t know a lot about the Vietnam War. In all of the classes I’ve taken, we’ve only talked about the draft and soldiers coming home with PTSD, but never about the reasons for going to war, or American conduct during the war. 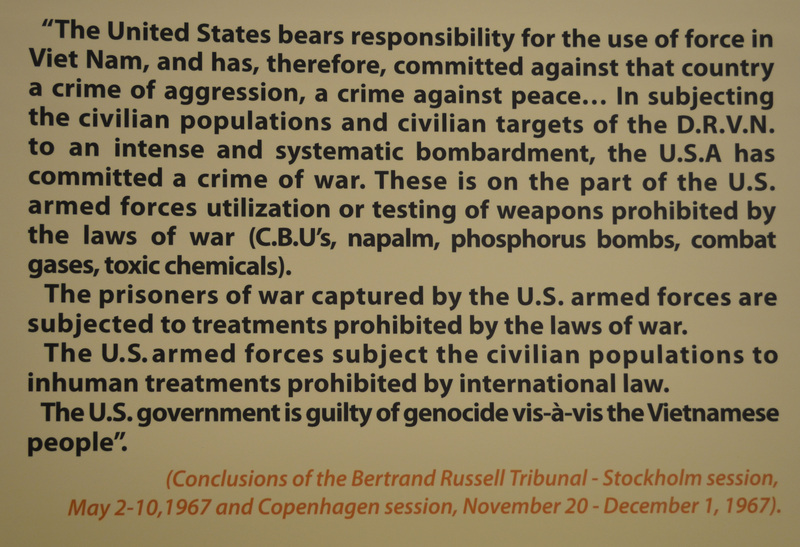 Before this year, I didn’t know that America had been accused and found guilty of genocide in Vietnam (albeit not by a large international body). I know I’ve been frustrated with how little Malaysian students learn about world history (swastikas are a popular gang symbol here, in part because they don’t understand the historical context behind it). Even adults in Malaysia have asked me about genocide and what it is (it’s included in the name of my major; people don’t just talk to me about genocide randomly, though I would love it if they did). Although we do have the freedom to talk about these issues in the US, touchy subjects, like the US being accused of genocide multiple times, are still avoided. Is this done out of a sense of patriotism, or the idea that America can do no wrong? Or is it that if we start talking about how the military can condone massacres during war, the public will have a lot more questions when we go to war again? 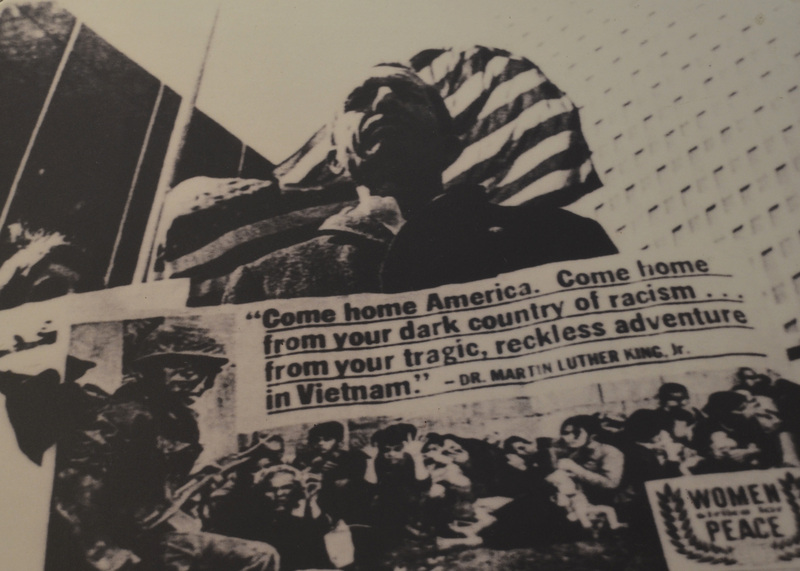 Again, I don’t know a lot about the Vietnam War, and I don’t think it particularly fits the definition of genocide, but the museum gave me a lot to think about. If you’re even just being accused of committing genocide, you’re probably doing something wrong. The museum also had a section on war photography. It feels strange to say that the photographs were beautiful, but they were. I can’t imagine the time or dedication it takes to go to a war zone, not only to document it, but to spend time thinking about lighting and f stops so that those photographs convey a message. 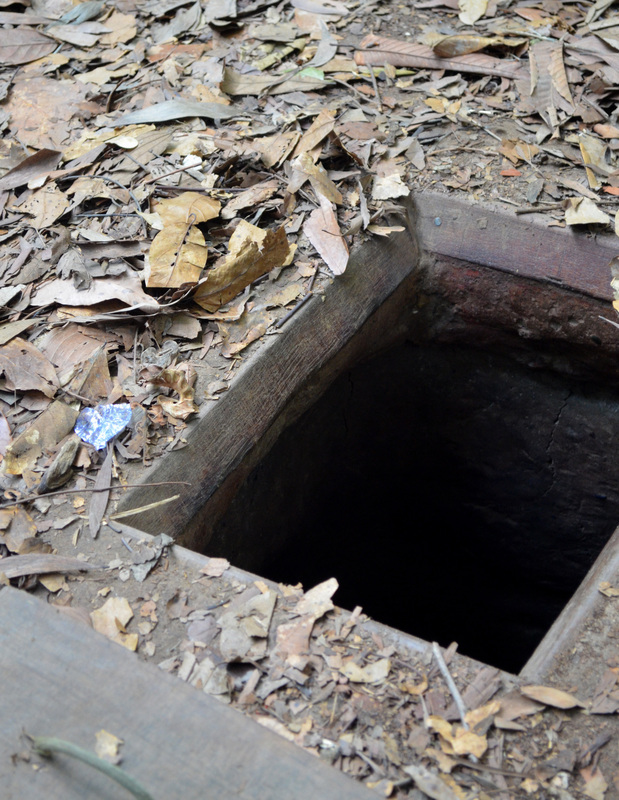 On our last day, we went to the Cu Chi Tunnels a little outside of Ho Chi Minh. The tunnels were used by Viet Cong to get around, ambush soldiers and transport supplies. Though the number of tunnels and the land that they covered was huge, the tunnels themselves were not. That hole in the picture? That’s the entrance to the tunnel. I could barely fit inside. Once inside, you couldn’t stand up straight. In the bigger parts of the tunnel, you could walk if you hunched over a lot. In the smaller parts, you’d have to crawl on your hands and knees. And they’re underground, meaning that it’s incredibly hard to breathe in there. Our guide allowed us to get inside a tunnel that’s been preserved (some of the other tunnels were made wider for tourists) and after about three minutes in there I had to get out. I couldn’t breathe, couldn’t see anything and also, there was a bat. It was terrifying and I couldn’t imagine doing that for years like some people did. I guess when it’s a matter of survival, you do what you have to do, but seeing sights like this confirm my opinion that I would not make it in a war. Our guide was a really intriguing man who had worked for the US military during the war, and you could tell he was really passionate about educating us about different aspects of the war. I can’t imagine spending every day taking a bunch of tourists to a place that reminds you of an incredibly trying time in your life. It reminded me of the man I met close to Murambi, a genocide memorial in Rwanda. He spent every day at that site because his wife and children had died there. But it wasn’t a sad place for him. Rather, it was his way of connecting with them, and he seemed to find comfort in spending time where his family spent their last hours. And our guide for the Cu Chi Tunnels seemed to be the same way. There was a point in the tour where you could stop at the shooting range (yes, a shooting range at a war memorial) and our guide mentioned that it made him really happy to hear the gunshots. He said that before, when he heard shots, he knew his friends were dying, but now when he heard them, he knew no one was dying. Not everything I did in Ho Chi Minh had to do with the war. 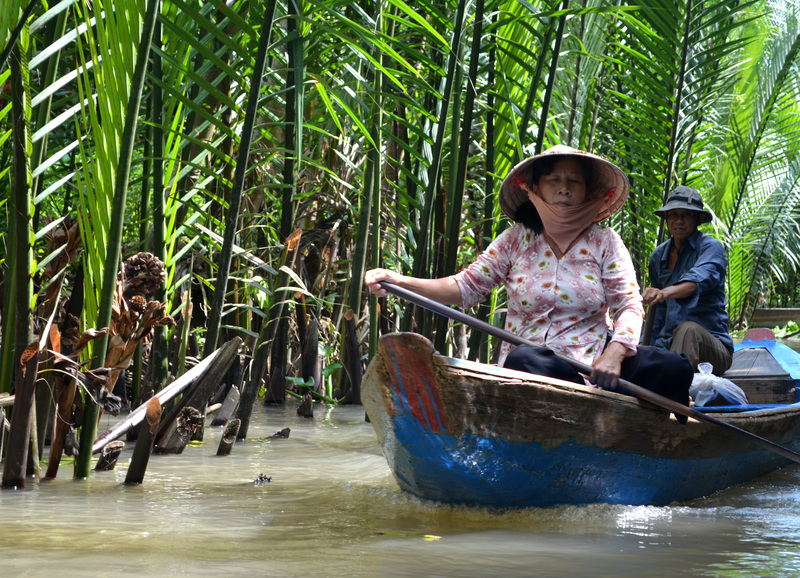 We took a boat trip on the Mekong Delta one day, and saw a small coconut candy business. There was also a random python there that you could hold. Because why not? We then took an even smaller boat to a village to hear some traditional songs and eat fruit. The highlight there was a really ugly looking fish that freaked out when someone made a face at it. All in all, the boat trip was alright, but since I was comparing it to Ha Long Bay, which was amazing, it wasn’t the greatest. 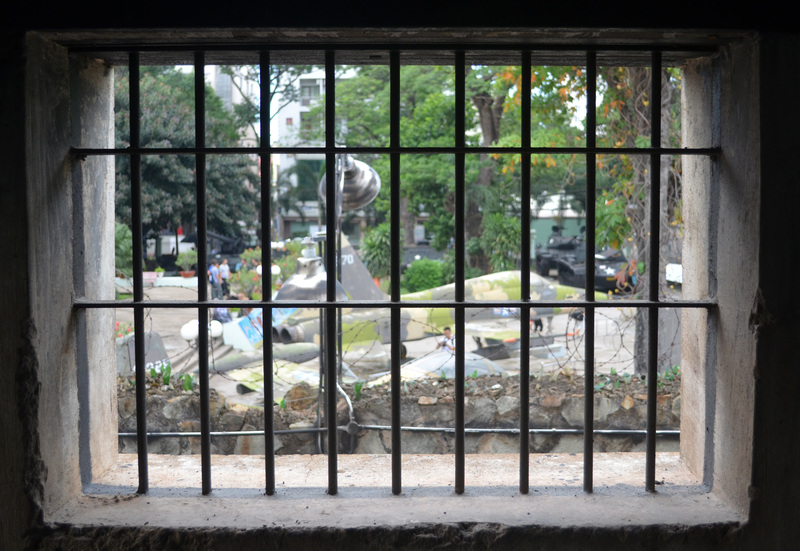 I know I started out saying that Ho Chi Minh wasn’t that great, and I still like Hanoi better, but through writing this post, I’ve realized that the city gave me a lot to think about. And that’s pretty valuable in my book.